This project is about the requalification of the “Quartiere Adriano” in the north-east of Milan and is included in the most wide project of “Ri-formare Milano” The question of suburbs is a theme that interests different areas of the Metropolitan City, the school of architecture at Politecnico di Milano wants to analyse and to experiment many solutions in order to measure with the complexity, the articulation and the potentiality of this problematic zones that nowadays following remain unresolved. In particular this project works on the “corridoio verde”, a green area that cross from east to west the neighbourhood and that is now occupied by the transmission line. In a future forecast of bury this electric system the project wants to return this void space to the community, to the people who lives in this area, with three different layer of intervention. The first is the layer of the street. A new infrastructure to connect the “quartiere Andriano” with the nearby underground station of Cascina Gobba and tangenziale est, that wants to be a secondary road, less traffic, and easily crossed by pedestrians and bicyclists with also a new tram line. The second layer is the green linear park, that cross all the area and is designed in order to have different type of spaces, with trees, flowers and also an urban garden available from citizens. The last layer is the equipment one, that wants to giving the chance to practice a lot of different outdoor activities, there are for example some play fields, playgrounds and also an equipped area where organised conventions, expositions or also parties. All the interventions wants to give a new life to this free space that now doesn’t reflect the needs of this neighbourhood. The project ends with two new buildings that host the library and other connected activities that create a final point for this multifunctional space and connect the linear park to the canal of Martesana and to the system of “parco Lambro”. The project stems from the “memory” of the site in which the Navigli’s water completely surrounded the area and created an island where the existing building rests. In an attempt to blend the public space with the private spaces of the project, the “flow of water” is replaced with “flow of motion”, creating a fluid public space that offers translation between the different levels of the site. The fluidity of motion in this project augments to the how “freely” one can move throughout the entire project, making the exiting paths and the new ones indifferentiable. The outer flow of motion in the project is perceived as a historic timeline; “the past”: taking place in the historic channel where the water once passed and where the traditional architecture is reflected and ends at the other end of the site: “the present” and where the visitor is set at a point reflecting the modern side of the area and all the changes that had occurred architecturally. The volume frames the old building as a memory with a volume on each side and bricks are chosen as a material that offers different transparency regardless of its rigid form. These transparencies correspond to the need of the privacy or light in the interior spaces and creates an animation of texture on the exterior facades. The first part of our work consisted in the study of Glenn Murcutt’s Marie short house. Located on farmland in northern coastal New South Wales the Marie Short House was designed in the 1970s, later purchased and altered by Murcutt in 1980. The house plan is disarmingly simple with two almost identical pavilions, rotated and slipped; Each pavilion is composed by structural timber bays, the last two bays treated as an open entry porch. Between the two, a thickened wall implies an external corridor which links the porches and accommodates the collection of rain water. The strategy to repeat and distinguish the pavilions by function is extended to the kitchen and bathrooms where each functional component is individuated, repeated and grouped as a cluster of cells. The spatial contrast between the service and living zones heightens a sense of generosity in the larger rooms. The abstract and original re-presentation of familiar forms such as the pitched roof and entrance porch using local techniques and materials assigns the building an important position within the pursuit and evolution of modernist architecture in Australia. Our project consists of an extension of our assigned case study. 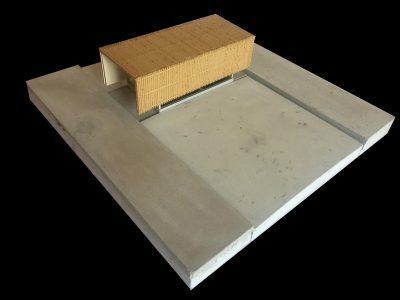 We decided to realize an independent pavillon, that only has a visual relationship with the existing building.The concept is to create a space of meditation in total relation with the nature of the site, a pavilion that in the vastness of the prairie focuses on creating a relationship between the man and the water; for this reason the idea of ? ?creating it in the middle of an artificial water basin that contained another pool inside. Our intent was to respect some of the design ideas that Glenn Murcutt used in Marie Short house. We reused the same modularity in our plan,and we have recreated a building that is detached from the ground and that gives the impression of being floating on the water. Thanks to the different dimensions within our project we managed to create different relationships between the pavilion user and the water that surrounds it, both visually and physically, creating a space illuminated only by the frame that surrounds the building at floor level that manages to create an atmosphere suitable for relaxation and meditation. As in Marie Short House we have designed a wooden frame structure with different types of wooden finishing perfectly integrated in the Australian countryside surrounding. The building wants to reach its potential of interacting with such natural elements as the sun light, the rain water, and the physical context extremely generous in that region. Therefore it shows how architecture can provide the opportunity to emphasize nature’s free gifts creating spaces of quality for anyone who inhabits them. Maria Cristina Giambri e Karyna Kalchenko. Two themes intertwined in this project are creating a social gathering space, at the same time embodying a sacred sanctuary. The space has to enable a certain religious community, as well as anyone from the outside to feel welcome, to communicate and interact. The golden ratio and the shape of the Nautilus shell were chosen as primary symbols at the concept stage of the project. Starting from the centre, which is ourselves and our belief, the ideas and experiences shared, widening the circle – like the shape above. The sacred geometry forms depict how nature and mathematics work together to create complex yet functioning structures and this is what we believe in. When analysing the context of the area, it showed a neighbourhood of mixed use. The building site of the church marks a midpoint between a university campus and a residential use zone. Having the definition of a gathering space, the project had to promote continuity on multiple design levels. It features a parvis leading to a tennis court in the backyard of the church, both aligned to a pathway connecting the main street and the pedestrian zone. This pathway is narrow enough so that people would have to consciously choose to pass through there instead of being attracted there. Its narrowness also shows hierarchy between it and the wide passage/piazza (via AM Ampere). Part of the necessary functions are found on the ground floor. The liturgy hall hosting 450 seats, with a double altar and an organ instrument. It is designed in a way that the construction system of columns and beams holding the glass roof create continuity in space when seen in perspective. There are two smaller chapels and a baptistry as welL. In the other building there is the cafeteria and vertical communications. The structural system consists of steel construction and reinforced concrete. The materials are also used in a symbolical way where they represent the ‘holy trinity’. The reinforced concrete load bearing envelope as the Father; Continuous beams and roof support of steel as the Son; And flushed glazed roof of glass as The Holy Spirit. Also attention was payed to the symmetry of facades since it creates a sense of harmony. The building was a former colonia that used as children’s summer holiday camp. It was built during the facist era of Italy, and designed in the rationlist architectural style. The building was constructed with a reinforced concrete frame, and external masonry cavity walls. The colonia locates in the countryside close to Genova, which surrounded by hills and forests. On top of the roof there is nice view with landscape of hills and greenary. Few concepts were important when designing the renovation of this building. 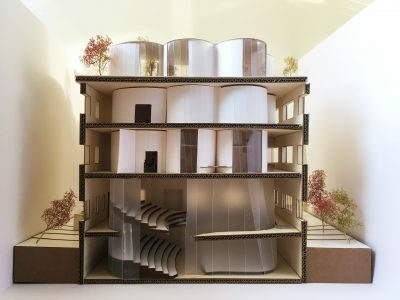 First, we do not want to change the existing structures, as a result, we inserted new space within the exsiting building, as you can see in the model those curvy organic shaped space. Second, we would like to distinguish and give new life to the building, that we designed those organic shaped space inside the original rigid design of the rationalistic style of the building. Of course, those newly inserted structures can be removed later if one day the users no longer like them. The important concept is to keep the space flexible and editable in the future, and at the same time keep the original historic and structural value. Third, given an advantage of natural landscape around the colonia, we would like to combine and introduce the surrouding natural environment to the interior, some parts of the exisiting windows are removed, and transformed into loggia for the newly inserted space, which create a barrier between exterior and interior. The function of the building is a branch of the music school, that provides two theatres, dwelling for visiting musicians, sound recording studio, co-working space, jazz cafe, and instrument shop. The aim is the provide a space not only for students study in music school, but also suitable for families of students, visiting guests of school and also public. To project a new temporary residence we decided to start from the new open spaces in and out our building. Firstly we decided that the new internal square should be linked to the open space in front of the lot through a visual relationship, thanks to the use of a continuous glass window that runs throughout the building. The main entrance can be reached through the square that connects the sidewalk with the level at -0.98m of the entrance itself thanks to the play of triangles and various slopes. the flows are greeted by a double-height wall covered with a golden material. It represents the first visible element that leads to the entrance, located on the adjacent wall. The special feature of our building is the cladding. We decided to use a stainless steel cladding in iron grey, modulated according to four types, which contrasted with the clarity and transparency of the curtain wall on the ground floor, with the intention of recreating a box that would act as a filter between inside and outside. The concept of the BOX was also brought in the interiors of the project. In fact, on the ground floor, we have inserted three separate boxes that contain more private functions. In the basement were provided public functions such as a vertical supermarket, co-working and bicycle storage. From the upper floor begin the residences. As you go up the concept of residence becomes more and more linked to privacy. 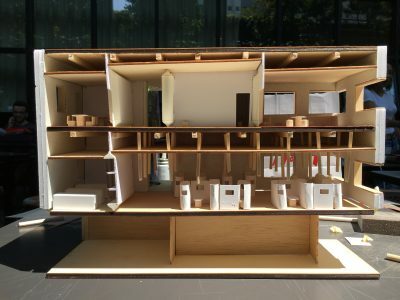 We begin with common kitchen and common rooms to then go up and find real apartments, for two or four people, or multi apartments (called MULTI FLEX) that can be divided if necessary. All the interiors are made flexible and temporary thanks to sliding panels, able to create privacy, but at the same time community. The internal distribution is also designed taking always into account the concept of the BOX, which is perceptible up to the roof. In general, the concept of BOX is treated in such a way that, on public and semi-public floors, it acts as a container, while the more space is privatised, the more the “box” acts as a content, that is, what organizes, manages and makes the space live. These are what we considered free spaces: a space in which you can be the actor of the place where you live. 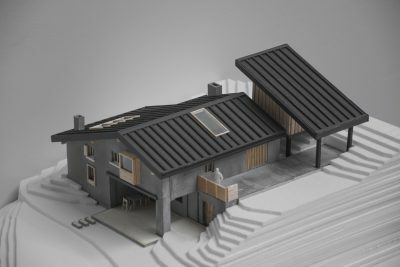 Our project is to reconstruct a small cottage in vesscasa bassa, which is a small village on the mountain behind Ponte di legno. The village is quiet well known for its cheese production. So we are going to rebuilt this building into a cheese workshop and restaurant as well. First, the cottage is well conserved, it works even we did not do anything on it. For this reason, we try to not change too much of the original structure. The extension will be added without any direct connection with the old cottage, serving as a house for worker. And by extending the roof, a sheltered space for milking, will be created. As we all know, milk is the indispensable material of cheese making and milking is also an interesting activity for tourists. After researching the process of cheese making we plan the upper floor as the workshop because people can work here by collecting milk directly from the farm on the hill behind. Meanwhile, the ground floor will serve as a restaurant for people to taste food cooked with cheese the made. On the north part of the cottage, we have a very narrow and low space. So we designed it as a double height and elevated the floor a little bit as well to shorten the length of the stairs. This part will be used as the dining area. Hello, everyone. This is Chen, from China. 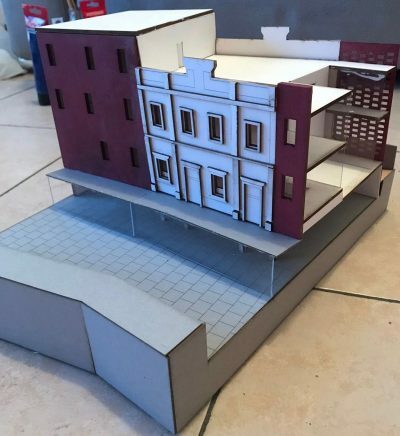 I am going to introduce the model of the Interior design studio, which is made during the second semester at Politecnico. The function of the building, which is decided by our group, is autism daycare center. And this is two floors out of the four floors building – ground floor and first floor. The ground floor is a dining hall while the first floor is the classroom for autism children. And the most exciting part of our project is the double wall system, which is made by curved wall. In the first place, the double wall system is designed to keep the noise out of the classroom for the need of the autism children. Later, we put some part of the furniture between the walls, making the room clean and complete. In that case, I would like to call them furniture wall. To be specific, there are three types of furniture wall, first the storage, with the beginning height at 40cm, storage is the most common type for different rooms; second, the desk, with the starting height at 70cm, desk is used in the big rooms and, they can also be placed a sink or some vegetation; third, the partition. 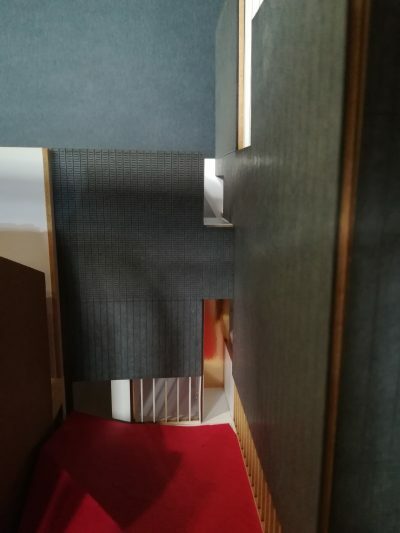 For the flexible use of the room, we design partitions hiding in the furniture wall, and they can be pulled out to separate the room when necessary. By applying the furniture wall system, rooms can get rid of cabinet and desk, to some extent. Just like the relationship between serving space and functional space, for example bathroom and bedroom, the wall is playing role of the serving space, which encourage the room concentrates on the function itself. In that case, the room itself becomes an more integral space, a free void. This project is situated in Vimodrone, a small city in the North West of Milan. We decided to characterize our project through a constant relationship with the forbidden green space in front of our building. The interest for the open space is born from a careful analysis of the territory. To strengthen this relationship we create a contact, visual and constant, between the existing courtyard, which is used today as an entrance hall element, and the underestimated green space taken into consideration. The ground floor of our project is, consequently an empty space, a public space, a space of transition but also a space to stay in which you can see both type of open spaces of our project. These relations create, according to our opinion, a sort of free space, composed by three different types of spaces joined together by physical relations. Thanks to the analysis of the flows of Vimodrone we noticed that near our project there’s an high concentration of flows caused by the presence of the metropolitan station and a big car parking. We therefore decided to place the main entrance of our building in the same position of the previous one, or in the street with less flows because in this way to access the building you have to be accompanied by the three types of space. 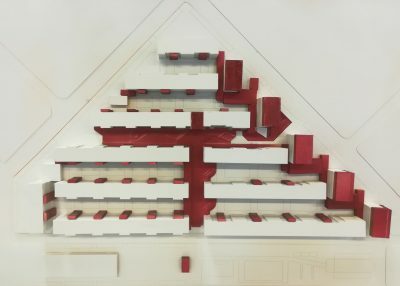 In order to create a temporary residence for workers /&/ travelers, we have carefully analyzed the program of the new building: the aim was to characterize the basement through a public function and, as you walk through the building in section, privatize more and more precisely the spaces used as residences, placing on top of real apartments, for a more permanent use. The main operation carried out was that of subtraction. 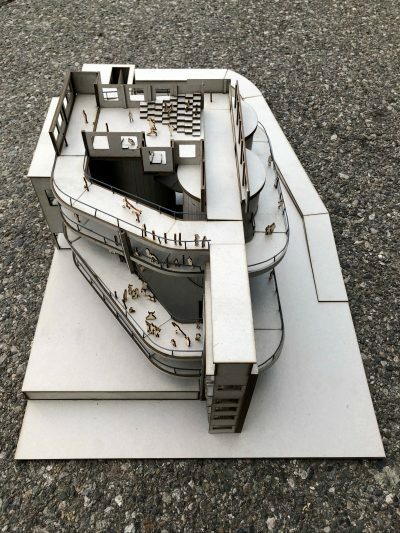 In fact, the architectural process we have faced has involved the elimination of parts of floors to create double heights that were intended to accentuate both the verticality of the new project, and the relationship with the open space in front of the building that was also perceived in elevation. In addition, we decided to also carry out real excavations both vertically and horizontally to always recreate a connection between inside and outside. In fact the open space is as if it modelled the entire building, capable of dilating and compressing space and material, as if the excavation carried out on the north façade crossed the main terrace and shaped the patio space. 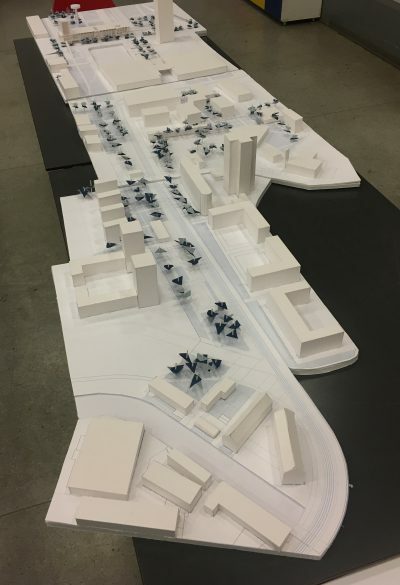 During the Interior Design Studio held by professors Rizzi and Sarto, ended some days ago, we focused on the regeneration of the popular neighbourhood of San Siro in Milan. We designed a masterplan in order to make the area more attractive and functional both to the inhabitants and to the citizens in general and then we focused on the interior design of some buildings of the neighbourhood. For example, regarding the topic of freespace as a democratic space for opportunities and uses not yet conceived, we decided to make the neighbourhood more permeable to the citizens and to offer more services and interesting places to the inhabitants. Firstly, we designed a public and pedestrian path which cut the parcel both in the traversal and in the longitudinal way: this path is not monotonous as it has slops, stairs, benches and green areas with trees in order to offer several places to play, meet people and share feelings. The main spot of this pedestrian path is a sunken square which connects this path to the main street via Ricciarelli and which stands as the entrance for a new multifunctional bar for the neighbourhood. Moreover, in order to create a self-sufficient headquarter, we decided to place commercial and tertiary activities like small shops, co-working and educational places on the ground floor of the buildings facing via Ricciarelli and the new pedestrian axis. We also designed a new access block to the buildings with a glazed parallelepiped for the entrance, a social gatehouse, which works like a joint between public and private, and a small activity for the inhabitants, like a baby- parking, a gym or a civic centre. Finally, the ground floor of each building was 1.15m high so, in order to make the entire neighbourhood accessible by everyone, we had to put a lift for each stairs block. As a result, we decided to put the lift outside the buildings and to characterise these lift towers by making them glazed and lit as landmarks of the area. During the Interior Design Studio held by professors Rizzi and Sarto, ended some days ago, we focused on the regeneration of the popular neighbourhood of San Siro in Milan. We designed a masterplan in order to make the area more attractive and functional both to the inhabitants and to the citizens in general and then we focused on the interior design of some buildings of the neighbourhood. For example, regarding the topic of freespaceas a free and additional space given to the users in order to improve their life, we decided to provide each building in via Ricciarelli with a newsolar greenhouse. We decided to design a solar greenhouse in order to solve the problem of the dimensions of the apartments: we had a lot of people seeking for a house in San Siro and not so many houses available with the right dimensions imposed by the Italian law. Due to these considerations, we designed this solar greenhouse in the south façade of the building as a device that can modify both the dimensions and the interior characteristics of the apartments during the year. In fact, during the summer it works like an ordinary balcony: the glass panels are opened while the wood panels can be moved in order to shade the space and the solar greenhouse appears like an exterior annex to the residential space. In winter, the glass panels are closed while the wood ones can be packed up in order to allow the solar light to permeate the greenhouse, which becomes an extension of the interior space. 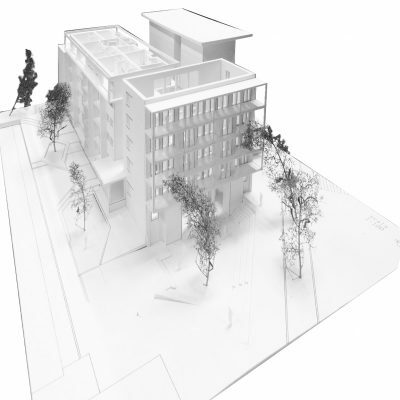 In this way, the apartments gain both quantitative and qualitative characteristics. The extension of the living room in the greenhouse enlarges the dimension of the apartment and it provides the users with a new space with different characteristics: the new winter annex is warm, sunny, comfortable and perfect for growing some small plants. The house we analyzed during the semester is the private home of the Danish architect Erick Christian Sørensen, located in Charlotterlund a few kilometers from Copenaghen. Built in 1954, the house incorporates some aspects of the modern movement, while trying to get closer to the typical style of Japanese houses, however, moving away in many aspects from the typical Danish residences located in the neighborhood. It is in fact a single-storey house slightly raised from the ground through a base; it presents a structure with wooden beams and pillars, which support a flat roof. The large glass panels of the façades, in combination with the wide roof covering, contribute to direct contact between inside and outside, guaranteeing wide permeability. The plant is free and through some simple dividers the different spaces are identified. From the driveway you reach the entrance of the house on the east side. Entering you cross a corridor that leads to the large living room connected to the dining room and the kitchen. In the west part of the house there is the sleeping area, which has two bedrooms and a bathroom. The area to the north, instead, is occupied by the owner’s architectural studio, with a division of the space into two rooms, one in order to accommodate clients, while the other one to work. Sørensen has also designed in detail the entire garden surrounding the house, studying the different woods and trees. The garden is divided into three parts through a wall of typical Danish bricks that delimit the area paved with gravel from the area left to garden. For our project we have developed a small pavilion with the function of depandance for guests, located in the north-east part of the house of the Architect Erik Christian Sørensen. The design idea starts from the desire to maintain the design features that the Architect originally thought for his home, that is materials, nature and structure. Firstly we developed the wall, made with Danish bricks, with a spiral shape, going to form the perimeter walls of the pavilion. The project is characterized by a double height space, which is accessed by a wooden walkway that, starting from the entrance portico of the existing house, surrounds the snail on two sides and leads to the pivoting door entrance of the pavilion. We enter an open space dedicated to relaxation, usable through the two Bubble Chair by the designer Eero Aarnio. Through a wooden staircase hanging from the ceiling we access the basement where we find a space dedicated to the rest characterized by the Bed of Eero Aarnio and a bathroom with shower. A fundamental element for this project is the light that filters through the small pavilion through the two glass walls, consisting of pivoting windows. For security reasons, the fixtures on the ground floor have a limited opening of a few degrees to ensure the recirculation of the air, while those in the basement open totally to allow the passage outside, where there is an apple tree that is maintained by the Architect’s original design. Another focus of the project is the relationship between exterior and interior, because for us it was fundamental to maintain a great permeability, since the modest dimensions of the pavilion. Another primary element of this project is the structure that constitutes it, which incorporates that of the original house. The perimeter walls in exposed brick, both outside and inside, support a structure of exposed wooden beams and joists that is proposed both for the inter-floor slab and for the roof. To the rafters of the roof is fixed the structure of the wooden staircase designed as an object composed of joints between horizontal beams, for the support of the step and fits into the wall, and vertical uprights with in some points supports to be used as a wardrobe for guests. 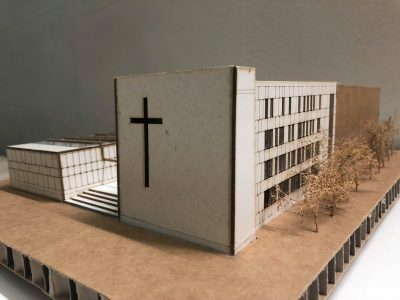 As a preparation for the design project, we made a study from the Church of Santa Maria Immacolata, Longarone, Italy, which is designed by Giovanni Michelucchi. Prompt of path from the church provides us a new view about plasticity of concrete. This magical material gives us more possibility. The thought about path and concrete then was used as a reference for our design project. 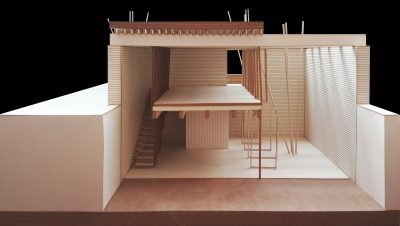 At the same time, the remaining structure can be flexibly renovated to fulfill actors’ houses and public performance spaces. With these functions, the striking concrete structure can attract more visitors. For respecting peculiar masses, we would like to use some spontaneous ways to accommodate more free spaces and multiple events. This building could be designed as a self-sufficient community as well as a concrete playground according to its location. Ramps are introduced as streets. They response to casual performance and all kinds of stories. They are wide for multiple people to walk, for children to play, for disabled people to visit, for street performance, for cycling or even riding a horse. The ramp extends from the bottom to the top, which connects the interior space and outdoor space. The slope of the ramp is 1:15, which is suitable for people to wander in the city, just like in the flat. With the variable space and light, and the floating site for performance and view, people could freely experience the performance and landscape, promenade across the whole building. There is a main theater, an open theater and two flexible performance spaces in the project. This building can provide more different spaces for different performances and activities. The ramp is the most brilliant place for casual performance and it is wide enough to hold a drama. The relationship on ramp between audience and actors could be very close. At the same time, a show can be seen from outside of the building and different levels of ramp. As for houses, they are important components to this small community. Actors can freely choose different place’s house in the building. Houses are connected by ramp, like streets and buildings. 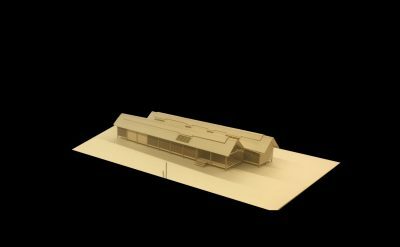 The project is about a small house-atelier in Milan that will host the artist’s home, an exhibition space and an operating laboratory for the production of sculptural, design, graphic and photography works. The idea of ? ?modularity, decomposition, of reproducibility and the reference to industrial architecture, has conditioned the design choices from the beginning. In particular, one of the main sources of inspiration for this project was the “Studio House N8” by Charles and Ray Eames which is a clear example of how a visible steel structure takes on the role of the main architectural theme. The title “Frame studio house 1” recalls the idea of ? ?the steel frame at sight as a paradigm of the whole project and the typical numerical element of an object intended for mass production. The project area is located in an industrial area, in the immediate vicinity of the Lambro park, where a natural environment meets the urban context. 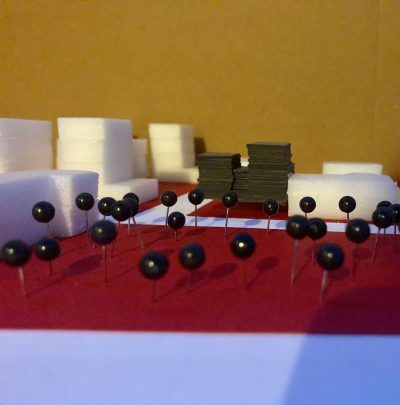 The project is related to this area, trying to resume both an industrial architecture and an organic architecture, thus avoiding the closure towards the context. In fact, the building was conceived as a steel frame, which follows the rhythm of a 5m by 7m module mesh, which allows the application and removal of panels, making the closing system much more elastic. 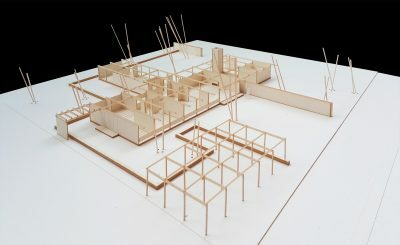 From the planimetric point of view, the atelier develops in the center of the lot and is identified with two main bodies, respectively the exhibition space and the atelier / dwelling, separated from each other by a tree-lined patio. The two components are connected to each other by a double height walkway that identifies a covered path, but not closed, also acting as a filter. 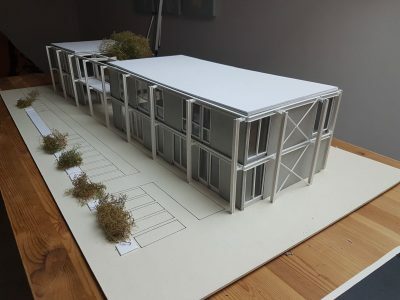 In conclusion, the main objective of the project was to create an architecture open to the context, through the steel frame system, the decomposition into parts, the system of walkways, the opening to the public, but at the same time an architecture that guarantees the tranquility of the working and living space.